The National Environment Research and Disaster Preparedness and Management Authority (NERAD) warns that thousands of households in the disputed Sool area in Somaliland are facing water shortages due to poor rains. Both Somaliland and the self-declared autonomous region of Puntland claim the Sool and Sanaag regions. 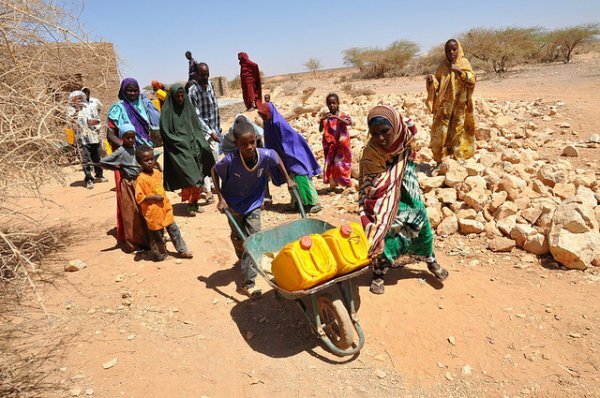 "We believe an estimated 3,000 households are facing water shortages in [the] Sool Region," said Mohamed Mousa Awale, chairman of Somaliland's National Environment Research and Disaster Preparedness and Management Authority (NERAD). Awale added that some drought-affected rural families had migrated to neighbouring areas, such as Togdheer and Buhotle, which had received good 'Deyr' rains - the rains typical from October to December. Others moved further south in search water and pasture. "But we are worried [about] the old people and the people who had no ability to move from the villages. [They] are in a serious situation and need water and food," he said. Commenting on the number of those affected, Sool Deputy Governor Mohamed Abdi Dhimbil said, "There is no accurate estimation, but I can only tell that the water shortage has affected the whole region. The nearest water source is 94km away, inside Ethiopia, and we believe that about 200 pastoralist families [are in] search of water and pasture in Somalia's Mudug Region." The price of water in Las-Anod, Sool's capital, has sharply increased since mid-February. A 200L barrel of ‘durdur’, or spring water, now costs $1.50, up from to $1 a month ago. A barrel of rainwater from the ‘berkads’, or water pans, has risen from $2.48 to $5. "The durdurs [springs] near Las-Anod have run out of water for the first time in history, and prices [have] increased," said Faisal Jama, a journalist based in Las-Anod. "The water price increase has [a] negative impact [on] our livelihoods. If someone's income is $150 per month, he/she needs $45 for water compared, to $22.38 a month [ago], and the remaining [money] is not enough to cover his/her livelihood needs," said Mohamed ABdillahi, a father of five. As the dry January-to-March  ‘Jilaal’ season progresses, more water sources could be depleted, according to a post-Deyr outlook by the Food Security and Nutrition Analysis Unit (FSNAU). "In the areas where the October-to-December Deyr 2012 rains were poor, including the Sool Plateau and parts of Nugal Valley, the dry January-to-March Jilaal will likely lead to rapid depletion of water resources, especially since many berkads did not get replenished during this Deyr. Long distances to water points for livestock are likely to be observed owing to more limited water access due to the high cost of water trucking," states the FSNAU report. The situation there could worsen with associated declines in food security, adds FSNAU. Some parts of Somaliland have started to receive some ‘Gu’ rains - the rains from March to May . But early forecasts by FSNAU indicate that the rains in Somalia will be normal to below normal in terms of total rainfall.